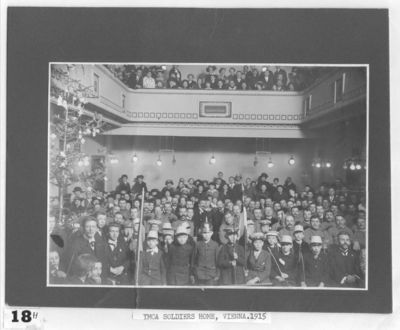 Soldiers and civilians enjoy Christmas celebrations in the Vienna Soldatenheim early in World War I. A children's "guard of honor" with flags and rifles stands in the middle of the photograph and an orchestra sits on the right. The Austrian YMCA sought to provide diversions for young men serving in the army.